Findings and thoughts on software development. I heard about this book a lot before I ordered it, and I ordered it on its release date. 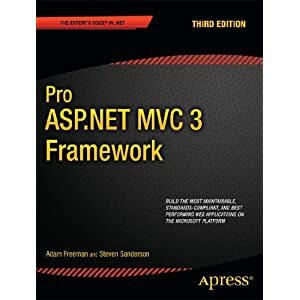 I had attended a developer meeting recently on MVC, and this book was recommended for continued learning. A friend had recently learned about MVC, became thrilled with it, and wanted to learn more. He picked the book out on his own, and I asked if he wanted to go through it together. I've been looking to start reading more, and I always felt better reading with a group of people simply because it is easier to discuss if you have problems, more thought from other minds, and it helps keep you motivated. So why was I willing to pick it up? I want to improve my knowledge of MVC. I did a few tutorials on it a while back, but I had no real training on it. It is the way the web will be going for the .Net side of things for the next few years, and I would like to keep my skills current.